I am planning ethnographic interviews for the new year and I’m putting together an equipment list. An ethnographic interview is a delicate thing. You are trying to build trust with a perfect stranger, sometimes in their own home or workplace. Two principles follow from this. 2. You want as much video/audio fire power as possible in the smallest form factor possible. You don’t want the camera, mics or lights to get in the way. We are an image-crazy culture so some people think their work is done when they buy a good(ish) camera. But sound is absolutely key. And that means buying a good microphone. The Sennheiser EW ENG G2 gets good reviews on Amazon. It’s around $700.00. Good lighting is also important and I am just not sure what the best/smallest kit is here. Dec. 18 addition: just came across the Westcott Icelight and while not cheap, this looks little and light. Here it is on Amazon. This entry was posted in Uncategorized and tagged anthropology, best audio for ethnographic interview, ethnographic interview, ethnography, Final Cut Pro, inhome interviews, Rob Kozinets, video camera on November 23, 2012 by Grant. I’ve been looking at this camera for interviews too. So from different sides of the pond, internet searches and word of mouth point in the same direction. I’ve always had good results with Sennheiser microphones too. Grant, this is doubtless an outstanding camera but I’m wondering if it’s overkill for the (ethnographic?) purpose you intend. The keys to great visuals, as you know, beyond the human factor, are glass and light. So you cover the lens part with the camera, but if you’re shooting in ordinary light, I’m wondering if an iPhone wouldn’t be just as good, using any of the available and all but invisible stands, and you’ve got a solution that is “good enough”. Of course for sound you can still use a high end microphone and many solutions to convert/connect to the phone (let me know if you need examples). Then you’ve got sound quality as great as you want. Forgive me if this is all heretical or obvious. I tend to go for portability because I don’t necessarily need something that really needs a made-for-TV quality and usually just for my own notes for my Forbes blog. 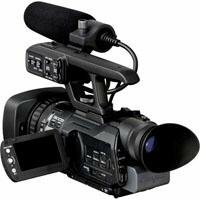 A top end video camera is nice but I don’t think its a need to have. Unless you really need the video resolution for a professional recording, a simpler but effective way today is enough with a high-end cellphone with HD video capabilities and a stand. The problem is really the lighting in the room or space. There’s no easy answer for that because lighting systems are not as portable and often need a lot of power. People are forgiving when it comes to visuals although not so for sound. A great mike is essential, but I still go for the straight to digital/laptop/ipad connection from the mike, especially so I can see audio levels.